I suppose the best vacations are when you have the opportunity to do the things you enjoy most unhindered. If its fishing, hiking, shooting or sculpting—the ideal vacation is when you can do those things without thinking about doing other things as obligations. And that was my experience recently while living in Canterbury, England for a few weeks in February 2017 shortly after the Trump election. That’s important to note because I was invested in the election of Donald Trump considerably and if he had not won I was planning to hunker down for a very tough battle, politically, and physically. But since he did win—I knew that things would be fixed which I recognized needed to be addressed politically before I ever invested in such a big trip—which I had been thinking about for a long time—because let’s face it—you don’t want to travel to the point of yearning for home but not look forward to returning because the Obama administration constantly reminded you that they were trying to make America into Europe—as opposed to the other way around. As it stood on this particular trip, Trump was saying exactly what I was saying about Paris as I was standing in the middle of it observing the reality—so it was extra sweet to return back through immigration in Charlotte North Carolina after being overseas for a lengthy period of time. If Trump had not been in office, I would not have booked such a big trip. But because he did win, I felt I could relax a bit and enjoy doing something I had been thinking about for a very long time. It is under this vacation condition that I found myself at the very nice bookstore Waterstones in Canterbury admiring their fantastic selection of books when I saw a real treasure—a 2015 publication I didn’t know about from the Joseph Campbell Foundation called, Romance of the Grail. I’ve mentioned before that I’ve been a member of the Joseph Campbell Foundation in the past even to the point of attending some of their events way back in the 90s—and I still get updates from them all the time which I enjoy reading. Somehow I had missed this book on Arthurian legends by Evans Lansing Smith written directly from Joseph Campbell lectures given before his death in 1987. The reading of Joseph Campbell books is something that I cherish greatly and if I wasn’t a whole lot of other things—all action oriented—I would have been quite happy as a scholarly intellectual living off tenure so that I’d have infinite time and resources to read and think. 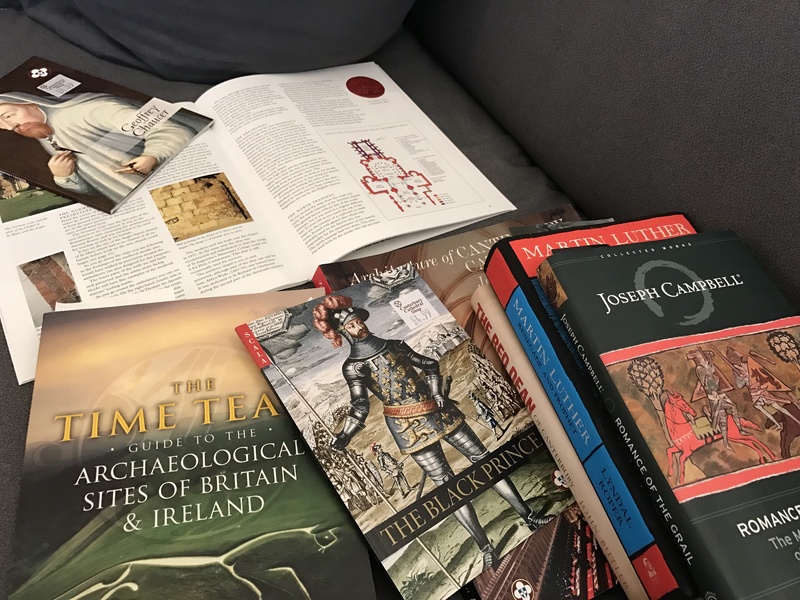 That’s why the vacation to Canterbury was so important to me—for a few weeks I was able to step out of my normal life, read lots of books, look at maps, explore a lot, and attend some of the greatest museums of the world day after day—and honestly, I loved it. I wrote and read a lot on this trip and every single day I found myself in some bookstore whether it be in London, Paris, or Canterbury looking at books to buy that were not for sale in the States and that’s when I saw that little treasure from the Joseph Campbell Foundation on Arthurian romance while looking through the comparative religion and mythology section of the great Waterstones bookstore which was three stories set in one of the most historic cities in the world—and most literate. I can say that the day I bought that book it was one of the best days of my life. Here was a Joseph Campbell book that I had not yet read—of relatively fresh material. Sure I had heard much of it in old lectures, but having it in print was very nice. And I was buying and reading it in a city where people loved to read and were sitting about drinking their tea and coffee looking down into the old Roman streets of Canterbury. The whole thing felt very intellectual and I enjoyed it immensely. Around the corner was a Burger King, which was much more my type of food, so my wife and I went there after our trip to Waterstones and I sifted through my treasures and started reading the new Joseph Campbell book. I was fully aware that this is exactly why many liberals are out of touch with the reality of the outside world. It is quite enjoyable to sit on a pedestal and contemplate the mysteries of the universe with a full bank account and access to the luxuries of life without worrying about solving problems day-to-day that affect people’s lives extensively. It was very pleasurable to read my new Joseph Campbell book without worrying about the time or the events of the world as I was about as removed from my normal circumstances as I could have been. The only thing I had that reminded me of home was my new books and all the time to read that I wanted—so my Whopper at Burger King tasted fantastic, my new books were treasures that I wouldn’t have traded for a pile of gold and for the first time in a long time I didn’t worry about what was happening in the world—because Trump was on the job in the White House. The Dow Jones was creeping up to 21,000 and my wife and I had plenty of money so not to worry about buying train tickets to London or Paris, or eating in any restaurant we fancied—so I had a taste of that intellectual life, and I liked it in the context of a vacation. One of the things that made that particular book so exciting and refreshing was the nature of the story of Parzival by Wolfram von Eschenbach written literally in the setting that I was staying in, a city formed by the Middle Ages of 1200 A.D. I had heard the story of Parzival and read the Eschenbach poem years ago, but it had much more potency reading it in Canterbury for me—because I was surrounded by the landscape of that time period. The Canterbury Cathedral was literally everywhere I looked as it dominated everything that happened in that town even to this very day—so it was very revealing to me to read through the updated Joseph Campbell book on Arthurian legends the story of Parzival once again there. Essentially a lot the way I do things was inspired by that story as I read it early enough to give meaning toward my natural inclination toward absolutely reckless behavior. I understood why I did such things after I read the story of Parzival. I knew it instinctively before, but I understood it intellectually after Joseph Campbell explained the metaphors of the Eschenbach version of Parzival. The Arthur legends are very laissez-faire, for instance you only get to the Grail Castle to meet the Grail King by holding the reins on your horse very loose. You can only do such things in life by living authenticlly—by living of your own accord. That’s what makes these old stories so important—they are the first of their kind which identifies the individual as an architect of their own destiny. In the context of history, this was big stuff—so I absolutely treasure these Arthurian stories specifically of Parzival and the Grail Castle. Given all that, it was a great vacation because of the literature and the ability for me to reach back to some of my roots away from the immediate catastrophe of every little thing that happens every single day. It was a window into how the intellectual class in our society lives, and I can see why they enjoy it. But, vacations are not reality—the real effort is in productive enterprise, and when the vacation was over, it was over. Yet gratitude is there in abundance for The Joseph Campbell Foundation for producing such a great book, and for Waterstones in Canterbury for being such a great bookstore set in such a fine, historical city. And for Canterbury itself—for surviving over 2000 years of evolution to provide my wife and I a nice vacation from the realities of life. It was a good trip, and I’m happy that books were able to be an important part of it. In my own way, it was my own little Grail Castle, and I was able to bring it home with me. And that is a real treasure. It sounds like you had a perfect get-a-way from all of the politics.